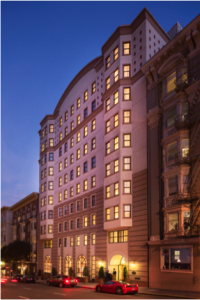 San Francisco — March 27, 2018 — Hotel Internet Services (HIS), a full-service provider of internet services and solutions for the hospitality industry, has announced the successful installation of its industry-leading Wi-Fi and BeyondTV platforms at the Orchard Hotel and Orchard Garden Hotel in San Francisco, California. Although located in a city well known for technology innovation, both properties suffered from the common issue of poor quality internet connections and speeds that adversely affected guest satisfaction. By partnering with HIS, the hotels have not only completely eliminated guest complaints regarding internet connectivity, but are also able to reflect the city’s tech-savvy spirit by catering to guest demands for casting personal content and integrating voice-activated control with the implementation of BeyondTV and Amazon’s Alexa. Previously relying on a Wi-Fi network over eight years old, both the Orchard Hotel and Orchard Garden were constructed with wide floor plans that included thick walls, and could not deliver the higher bandwidth and ability to connect multiple devices that today’s guests demand. Since leveraging HIS’ expertise on the latest Wi-Fi solutions and strategically placing robust industry leading Ruckus Wireless access points, both hotels have reported a complete turnaround in property-wide internet performance. A solution known for its ease-of-use, BeyondTV provides hotel guests with the ability to cast popular online video and music subscription services with the press of a button. Guests can also leverage the guestroom television’s larger screen and louder speakers to access their music, social media accounts or view and share personal photos or videos. Through integration with Amazon Alexa, guests can interact with BeyondTV via voice commands to control a variety of TV functions, such as changing the channel, casting from devices, visiting the app store or surfing the web. Voice commands can also be used to order services, such as room service or housekeeping, or to inquire about other hotel services and amenities. Upon check out, BeyondTV automatically deletes all personal data and also provides guests with the ability to manually remove their information at any time. In furthering the Orchard Hotels’ commitment to serving as an eco-friendly establishment, BeyondTV additionally allows the properties to eliminate the use of paper and printed collateral in providing guests with hotel information. 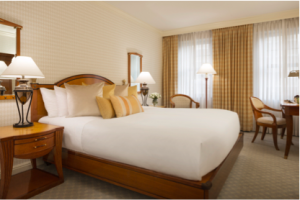 Instead, such details can be made instantly available within each guestroom via the television screen.